Original Artwork by Kathy. 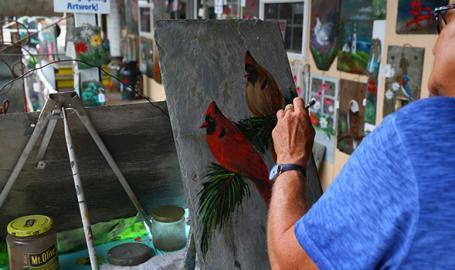 Come see Kathy paint on slate, windows, old barn siding, milk cans, benches, and canvas. Many of Kathy's pieces may be customized to make them more unique and personal; and she is generally able to create your one of a kind piece on the spot! Shipping is available. USA made Yard Art.